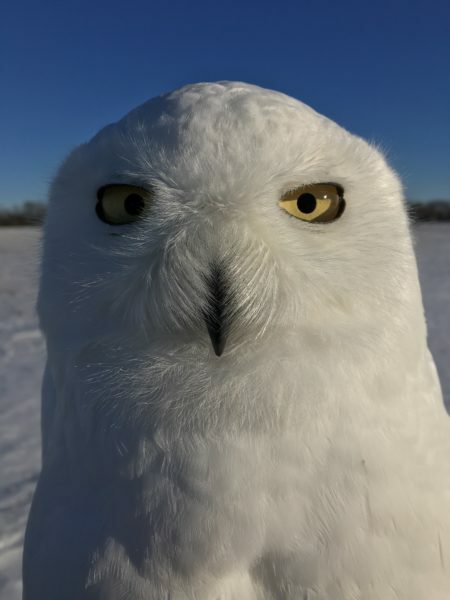 This is the time of the year when we’re on heightened alert for the first signs of snowy owls, both new birds coming south from the Arctic, and the first returning tagged owls from previous winters. As we noted a week or two ago, this year there has been an unusually early surge of snowies, and we’d gotten a brief transmission back in late September from Pickford, one of our 2017-18 Michigan birds, up on James Bay. 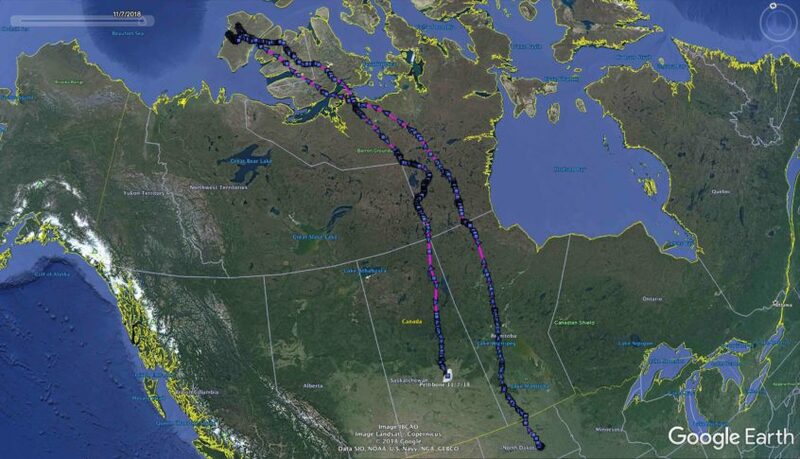 So we were delighted but not entirely surprised to hear from not one, but two of our tagged owls — both of which went farther northwest for the summer than any other snowies we’ve tracked, and both of which are now within a couple hundred kilometers of each other in southern Saskatchewan. 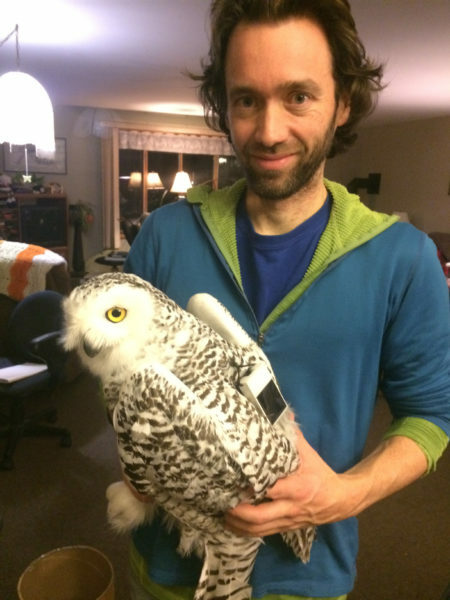 They are Pettibone, an adult male that Matt Solensky had tagged last winter near Jamestown, North Dakota; and Stella, an immature female tagged by a SNOWstorm team on Amherst Island in Lake Ontario as part of as study into the effects of wind turbines on that island’s wintering owls. Stella left Amherst April 10 and made her last transmission April 20 near Lake Abitibi on the Ontario/Quebec border. Pettibone, on the other hand, simply disappeared from his small territory of grassland and ag fields in Stutsman and Kidder counties, North Dakota, also on April 10, never checking in on his way north. That was concerning; while some northbound owls make it through southern Canada without connecting with a cell tower along the way, it’s unusual, and we couldn’t be certain that Pettibone hadn’t, say, been hit by a vehicle or met some other mishap that damaged his transmitter. Instead, we now know that both birds moved north and northwest into the far reaches of the Canadian Arctic Archipelago. In Pettibone’s case, he flew about as far northwest as an owl could fly and remain in North America — Banks Island, beyond which is polar waters all the way to Siberia. Stella stopped on immense Victoria Island, not quite as far — but because she started so much farther east, she actually migrated a longer distance, 3,440 km (2,140 miles) versus Pettibone’s 3,120 km (1,940 miles). Stella’s travels were the biggest east-west displacement we’ve seen among any of the 70 owls we’re tagged, a testament to the nomadic tendencies of these birds. Their movements revealed other differences that likely reflect their stages in life. Pettibone is more than five years old, a fully mature, almost completely white male; he had business in the Arctic, moving very quickly north after leaving North Dakota, at one point flying 1,200 km (745 miles) in two and half days to reach Banks Island. Except for a few hundred people in the Inuvialuit community of Sachs Harbour, Banks is uninhabited tundra and rugged coastline, the breeding grounds for nearly half a million lesser snow geese, and home to most of the world’s musk-oxen. Pettibone wasted no time; he zeroed in on an area along the upper Bernard River in the middle of the island, and except for one short excursion, for the next two months he remained within a very small, 3.8 km2(1.5 mi2) area. Unlike some tagged females we’ve tracked, for whom evidence of nesting is crystal clear because of the length of time they spend incubating and brooding at a central nest site, it’s less certain that Pettibone was raising a family. His locations cluster on high points like tundra hummocks and stream bluffs where he would have had good visibility, but there’s no one spot where he spent more time than any other. That said, male snowy owls normally don’t linger at the nest itself; they deliver prey to the female, who then feeds the chicks, and so even an attentive male might not leave much of a digital footprint at the nest site, compared with his hunting perches and guard posts. Stella, less than a year old, was far too young to breed this summer, and she loafed her way north, coasting along the western shore of James Bay to southern Hudson Bay by the third week of May, spending several days out on ice in the bay itself. Leaving Cape Churchill she angled northwest across Queen Maude Gulf to Victoria Island, where she spent the summer. 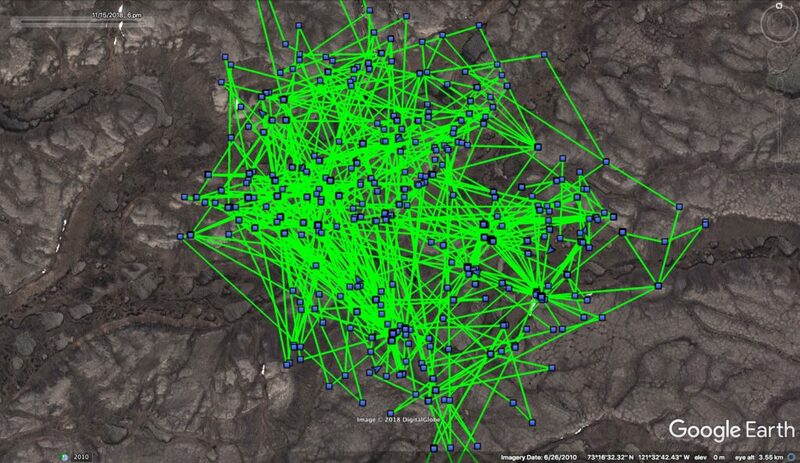 She occupied a 4 km2(1.5 mi2) territory but made several long excursions from it. Pettibone started moving south in mid-September, crossing to west-central Nunavut and spending a month moving slowly around Dubawni Lake on the Nunavut/NWT border. On Nov. 5 Pettibone started migrating quickly south into Saskatchewan, emerging from the boreal forest into farm country near the small town of Melfort, from where he checked in Nov. 8. Stella again took the long way, beginning Sept. 25 and meandering across the southeastern NWT to Lake Athabasca just inside Alberta, then backtracking at the end of October and arrowing straight south to near the hamlet of Eyebrow, SK, population 135, about 114 km (71 miles) northwest of Regina, on Nov. 15. In addition to the simple pleasure of hearing from these two birds again and learning about their summer wanderings, we were thrilled to see how well their transmitters are performing. Over the years we’ve struggled with the challenges of working with these owls, especially keeping a solar-powered unit charged up when our study subject often remains in dark and gloomy areas like the Arctic in autumn, when daylight is eroding by the moment. 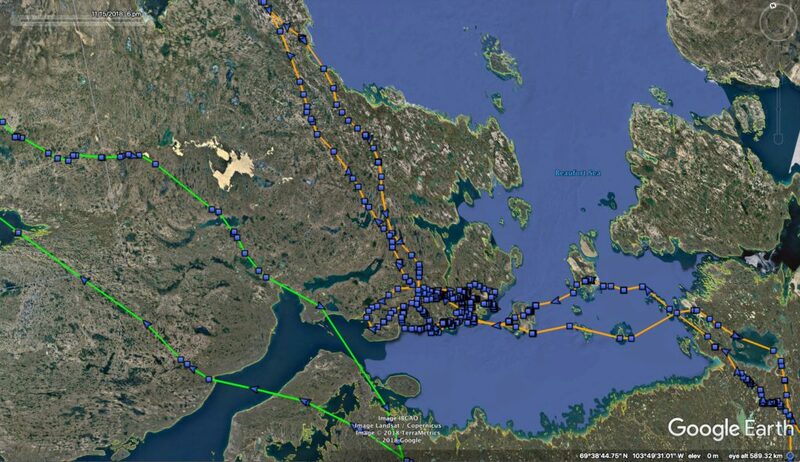 Almost all of the owls we’ve tracked south from the breeding grounds in the past have seen their transmitters go into sleep mode for a few weeks in autumn because of the short days and low solar angle, and CTT (which makes them for us) has been tweaking and updating their designs, software and duty cycles each year to make them ever-more efficient. It seems to be working, in spades. The data record we downloaded from Pettibone’s and Stella’s transmitter show they maintained full charges right through the summer and fall — and with strong cell connections in Saskatchewan, were able to upload their entire summer’s data backlog of thousands of GPS points in a single chunk. Pettibone’s, Stella’s and Pickford’s maps have been updated, so you can explore all of their movements in extraordinary detail — while we wait for more tagged birds to return. If you can give me a more accurate description of the location I can certainly keep an eye out for Pettibone during my Christmas bird count. 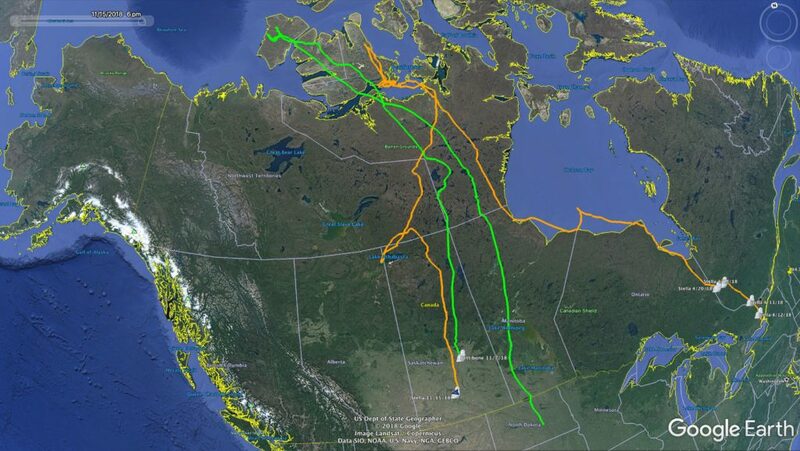 I live in Melfort Saskatchewan and keep track of my snowy owl sightings each year.